A decline in appetite and nutrition is a serious problem especially when seen in the elderly. Regardless the adage “they’ll wither and die” seniors do not have to wither before they die. Age doesn’t matter. As humans we require good nutrition to function. The body still needs energy and without the energy obtained from food, malnutrition happens. There are a number of reasons seniors eat less and when families or caregivers see these signs, it’s important they address them immediately. Dental Issues– Ill-fitting dentures make gums tender and sore. A quick trip to the dentist for regular visits (especially to have dentures and partials checked) is important. Sores, blisters and even serious infection can occur in the mouth and though a parent may have dentures, dental hygiene is still important for healthy gums and bad breath. Loneliness and depression – Depression and loneliness are major contributors in malnutrition for seniors. Their desire to live slips away and “the nothing left to live for” syndrome creeps in. A caregiver or regular visits and phone calls help with this issue. It’s not fun to eat alone and adding calls or visits at mealtime boots moral and the sense of being needed or loved. If depression seems evident, contact a physician for additional help and care. Bodily functions slow – As the body ages, the stomach empties slower, digests slower and the senses of taste and smell lessen. The body doesn’t crave to be fed but it still needs to be fed. Adding bright colored foods and “stick to your ribs” meals, helps. Bright colored fruit and steamed vegetables (steamed to a soft chew) are more enticing. Their consistency is softer and the availability is much easier for snacking. Baked sweet potatoes, oatmeal with a spoon of powdered milk added, thickens to an easier consistency to aid the swallow reflex. Adding cinnamon, thyme, and other flavorful and aroma filled spices to warm cereals and hot teas aid in stimulating hunger. Dementia – Varied types of dementia lead seniors to simply forget how to prepare foods or even how to or when to eat. As dementia progresses foods must be pureed to a consistency that can be sipped through a straw or from a spoon. Careful monitoring is required at this stage as the body will forget how to swallow and choking is a hazard. Preparing meals is too cumbersome – Seniors are more apt to skip meals when they feel cooking is too much for one person. Adding easy to cook meals is a great answer. Though frozen meals are not high on the nutrition list, something is better than nothing. So add easy one-step meals to the freezer and look for meals which offer more vegetables and higher proteins. Rather than purchasing the single serve meals, purchase the middle size (2-3 serving size) this will allow for left overs that can be reheated for another meal. Prepare casseroles that can be broken into single or double size meals and frozen. Small fresh servings of salad, coleslaw and cut-up vegetables can be placed in zip-loc bags for easy access. Hydrate, Hydrate, Hydrate – A great investment for aging parents – a water cooler. Companies will deliver and change the water bottles to prevent seniors from lifting and tugging. Coolers are available with hot and cold water making it possible for hot soup mixes, coffees and even some one-step meals to be prepared by simply adding hot water. Keep cups or plastic glasses in the places seniors frequent most. If it is there, they will usually sip. Yes, loss of appetite is a sign of aging. But it is not the norm. 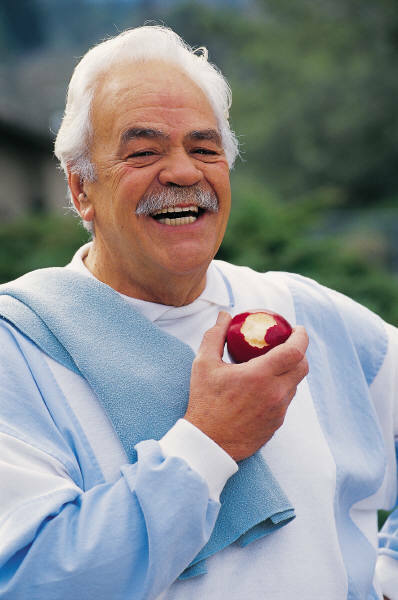 When seniors skip meals or weight loss occurs, seek the guidance of a physician and a nutritionist. Remember, eating is essential to good health…regardless of the age. The care of an aging parent is important. It’s difficult enough to invade their independence with a caregiver but placing them with someone who’s personality doesn’t mesh, is worse. The role of a caregiver is tough and finding the person who possess the “gifts” necessary is important for the happiness of your senior. Here are a few qualities that every caregiver should possess before they become part of your aging parent’s daily routine. *Willingness for Flexibility – It’s important a caregiver be willing to “bend” with the changes in the life of client. Changes in routine and schedule are not always wanted but are certainly a given when caring for the elderly. Working with the “flow” is an important quality. *Patience – If a client suffers with a dementia patience becomes a must. Repeated questions, constant reminding, and difficult moods require a person with the ability to change and adapt. One who is willing to smile, repeat, and move on. *Listening – Sometimes the best medicine is simply to listen, hold a hand, and be supportive. Knowing a caregiver cannot always “fix” things is okay, but are they willing to sympathize and encourage? *Attention to Detail – Finding the caregiver who has the gift to catch the “little things.” Things that may not seem important to most, are monumental to a senior. A caregiver with the gift to notice the small things and act on them is a jewel. *Joyful – A caregiver who has the gift of happiness and joy is a welcome individual into the sometimes lonesome life of a senior. It’s important a caregiver leave their personal drama at home and bring a peaceful, kind and happy attitude to work. Happiness, singing, and laughter are proven morale boosters and sometimes they jog an aging senior’s memory to a time when things were different. *Pro-Active – A caregiver should be pro-active in the care of their client. If something needs to be attended too, they make the necessary calls or take the initiative to do something. Including their senior into the process of daily activities is healthy and motivating for seniors so sharing the task of cooking over simply taking charge, encourages important cognitive skills in the elderly. No one is perfect. But the search for a caregiver can be much easier when you know what to look for. In part one of Loving Care for Aging Parents we listed questions necessary to help family members begin to make a plan of care for aging parents. From the physical needs of the parent to personal affairs and financing. Now it’s time to put together a plan. There are important issues to consider when a family decides to find a caregiver and generally two options for locating a caregiver. Here you will find the pros and cons of both. There are many wonderful people willing to be paid as a caregiver however when hiring a private duty caregiver there are some things that should be considered. Though hiring a private duty caregiver may cost less per hour it does not always pan out in the long run. Unemployment taxes still must be paid, if a family is to be honest. Many people are paid, “under the table” but this is not legal nor ethical. If your family chooses to hire private duty, then check with local state agencies to handle the taxes, social security and Medicare costs that should be paid. A huge misconception for many is a homeowners policy’s medical payments will pay if a caregiver is injured in the home. Not so. Medical payments cover “guests” in the home, not paid individuals who work for the homeowner. It’s not out of the question for homeowners to be sued. Workman’s Compensation can be pricey but certainly not like being sued. Finally, background checks should be done by the hiring family. It’s important that families invest the $25-$30 to do local and national background checks. Never accept a background check from the caregiver. These can easily be manipulated so for the best care possible for aging parents, do background checks yourself. Finally, when hiring private duty, personal illness and issues must be taken into account. Should your caregiver be unable to work then your parent is left without care. Though there are many private duty caregivers who are wonderful, the financial aspect is not as cheap as it seems. Below are pros and cons to hiring a company to provide caregiver services. Yes, the price of hiring a caregiver company is a bit higher, but when the individual costs hire and maintain a private duty caregiver revert to the consumer it doesn’t take long to see the value in hiring a company. When families hire a company, use good common sense. Ask if total price is all inclusive or if services are charged according to the task. Some companies will say their cost is $10 per hour but if a bath is given to a client, the price goes up an additional $10. Suddenly the costs are now $20 per hour. Check that charges are all inclusive with the exception of holidays. The hassle of paying unemployment taxes, Social Security and Medicare are the responsibility of the company as well as providing workman’s compensation . Companies also bond their employees and carry employee theft and liability insurances. Background checks are required by law and companies must meet Federal and State mandates for elder care. Hiring a company means families will never be without a caregiver should the primary caregiver be ill or on vacation and long term health insurance will pay if a company is working in the home where many make exclusions for private caregivers. Should you find a caregiver whose personality doesn’t quite mesh a company can provide a change. Finally hiring a company does not tie up home and personal assets. When a parent enters a facility, their assets are part of the financial care obligation. Every family must choose for themselves what they think the best method of care is for an aging parent. With these tools the decision process should be a bit easier. When the time arrives to add caregivers into the daily routine of your aging parent questions rise. Who do you hire? Where do we look for reputable help? What attributes do caregivers need? The list continues to lengthen with questions from salary, taxes, transportation, and on and on. Questions quickly become hesitation and hesitation turns to fear when the answers are not easily found. In this two part series you’ll find ways to help you begin the journey of adding a caregiver into the routine of your parent. Begin by making a list of the specific needs of your parent. It’s easy to become overwhelmed by the choices verses the true needs. Finances will play into the need as well. However, don’t be stopped by finances, rather make your list of needs as though there are no financial issues. This will allow you to quickly narrow down “wants” verses real needs. *Are they able to take care of personal hygiene? *Are they a fall risk? *Can they manage dressing alone? *Is driving still an option? This list of questions will help gage your thinking process to the important issues. Once you’ve answered the questions then you can begin to look at how to meet the needs of your aging parent with wisdom. Once you have all these items in place, call a family meeting and discuss who will manage the process. Include your parent, even though there are times this may not be possible if a parent is unwilling…try. Finances immediately press the stress button for most families. Relax. This is definitely important but it’s not a reason to panic. It’s simply an obstacle that must be worked around. With this information in place you can now look logically at the future care of your parent. Once you are aware of all the needs, necessities and assets, begin to look closely at the exact needs of your parent. Can they manage well enough to remain at home or is their care beyond a home setting. Keep in mind, it’s a proven fact the elderly thrive in their own homes. If at all possible, make “their home” the goal of their place of care. Taking these steps will help get you on the road to preparing for long term care for your aging parent. In part two of Loving Care for Aging Parents we’ll discuss putting a plan of care into action.